Insects make up the vast majority of animal biodiversity and have been studied intensively in the lab, providing numerous insights into how evolution works. However, there is now a serious imbalance between what we know about evolutionary biology in the lab and what we know about how things actually work in nature. For the last 8 years Rolando Rodríguez-Muñoz and myself have been monitoring a population of field crickets in a Spanish meadow. We tag every individual and record their lives using a network of >100 video cameras. We measure the reproductive success of every individual and the pattern of relationships across generations using DNA fingerprinting - we are collaborating with Jon Slate to use a panel of 384 SNPs for this task. This comprehensive information about every individual allows us to answer questions about the relative importance of natural and sexual selection , conflicts of interest between males and females , inbreeding risk and avoidance in the wild , variation in selection across years, the effects of density and social structure on selection, ageing, heritability of traits and loads more. Our WildCrickets.org website is dedicated to this project. The question 'why do females mate with lots of males?' is a major issue for evolutionary biology. We need to understand female mating behaviour because it has very broad implications for things like understanding competition between males, mate choice and why males typically produce such huge numbers of tiny sperm. Male promiscuity is easy to explain - every mating means potential new offspring for males. Females are limited by their ability to produce offspring, and typically get more sperm than they could ever use from just one mating - so why do females of nearly all species mate with more than one partner? It has been suggested that females may mate repeatedly as a way of choosing between males. The idea is that females might be able to choose sperm from males with whom they are genetically compatible or invest more in the offspring of such males . This way, even if females don't have any choice over their mates, they may be able to tell during mating whether a male is a suitable mate, or may be able to tell afterwards from the properties of the males' sperm. This might provide females with a benefit of promiscuity - an opportunity to choose the father of their offspring even if they can't choose their mates. I am investigating this question using insect model systems, particularly, field crickets Gryllus bimaculatus. 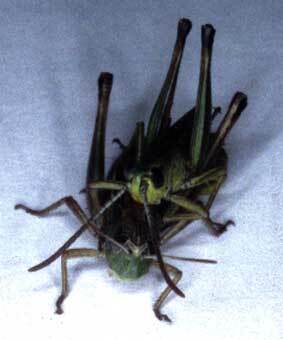 My work has shown that female crickets who mate with more than one male have increased offspring viability . A subsequent study, in which I mated females to related and unrelated males revealed that inbreeding reduces offspring viability, but that females mating with both siblings and non-siblings have offspring viability as high as if they'd never mated with a related male . We have now gone on to demonstrate that females can indeed bias sperm use in favour of unrelated males through differential uptake and storage of sperm . Insect model systems provide opportunities to test some basic predictions of sexual selection theory, and to examine conflicts of interest between the sexes. I have used field crickets to demonstrate that fathers successful in gaining mates have sons who are also successful . The origin of species remains one of the big questions facing evolutionary biology. To test hypotheses for what drives divergence and reproductive isolation between populations I have studied populations of the meadow grasshopper Chorthippus parallelus. In collaboration with Roger Butlin we used the approach of measuring divergence in phenotypic traits and premating and postmating reproductive isolation between populations, and then comparing observed patterns with the predictions of the existing hypotheses. Our approach allows comparison of the contributions to reproductive isolation of different ecological and demographic factors. Likelihood analysis reveals that long periods of allopatry are associated with postmating reproductive isolation, but not premating isolation, which is more strongly associated with range expansion. Neither premating nor postmating isolation is higher between populations differing in potential environmental selection pressures. Interestingly, there are only weak correlations between patterns of genetic divergence and phenotypic divergence and no correlation between premating and postmating isolation . This suggests that the potential for mate choice in animals may affect the types of factor that promote speciation. More recently, in collaboration with former graduate student Frances Tyler and research fellow Thor Veen we have been examining patterns of reproductive isolation between the crickets G. bimaculatus and G. campestris . which turn out to have multliple pre-mating, post-mating and postzygotic barriers to gene flow. Advances in video technology over the last decade mean it is now feasible to study insects and other small animals in their natural habitats. The main bottleneck preventing a range of fantastic new studies is the time it takes to collect basic data from digital video recordings. We are developing new software to automate individual recognition of tagged invertebrates and other small animals in the wild. The project is a collaboration with Richard Everson and Jacqueline Christmas in the School of Engineering, Computing & Mathematics at the University of Exeter. Adaptive radiations are a key process in the genesis of biodiversity. In collaboration with my former PDRA, and now University of Lincoln lecturer, Daniel Pincheira-Donoso we are investigating the potential for speciation and sexual size dimorphism to evolve as alternative outcomes during adaptive radiations. We are using the lizard genus Liolaemus - one of the largest terrestrial vertebrate genera, to conduct a major comparative study using assemblages of lizards from throughout South America. I'm collaborating with Mark Norman and Julian Finn of the museum of Victoria, Melbourne in studying dynamic mimicry in cephalopods. The unique abilities of octopuses, squids and cuttlefish to rapidly change their shape, colour and texture is unrivaled in the animal kingdom and promises new insights into the evolution of mimicry. Our work on giant cuttlefish in Spencer Gulf, South Australia revealed the first example of males facultatively mimicking females in order to avoid the attentions of competitors. The mimic octopus in its lair, a banded sea snake, and the octopus mimicking this species. Our observations of the as yet undescribed 'mimic octopus' provide the best and arguably the first examples of anti-predator mimicry in a cephalopod . The mimic octopus is able to produce an astonishing range of forms and movement patterns, resembling at least 3 poisonous animals in its habitat, including banded soles and lionfish. We have also recorded the first encounter with a live male blanket octopus - a species in which the female is 40,000 times larger than the male - the highest degree of sexual dimorphism in any animal larger than a few cm. Recently we observed the first example of tool use in octopuses, recording examples of veined octopuses carrying coconut shells and deploying them as a shelter when required .